MWS-79RF Milliwave Rangefinder - HiTECH Technologies, Inc. THE NEW COMPACT 79GHZ MILLI-RANGER!! The type No. MWS-79RF Milli-Ranger is a milliwave range finder which uses the FM-CW system. 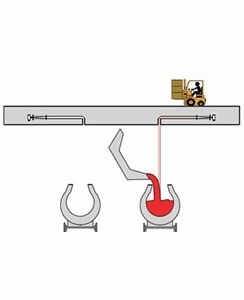 Through use of guidepipes and reflectors, the controller can be installed away from the high temperature area.The reflector can be installed in the high temperature area and the controller in the normal temperature area, enabling measurement under high temperature even without cooling systems. The flat casting floor allows heavy machinery to keep moving freely without obstruction. Unaffected by adverse conditions Microwaves are unaffected by heat, flames, and air particles. The reflector and guide pipes can be used in very high temperature areas, while the antenna can be used in temperatures up to 150°C. The controller should be installed in normal temperature areas. High accuracy and reliability The 79GHz model uses a smaller antenna, creating a sharper beam angle. This makes the Milli-Ranger ideal for installations where space is limited. Previously difficult measurements with large rest angles are now possible with milliwaves, therefore the Milli-Ranger is suitable for measuring sloped surfaces of anything from powder to lumps of material. Accuracy ±10mm False measurements caused by double-reflected waves are eliminated through the use of rotary microwaves. The accuracy of the measured range is not affected by fluctuating temperatures, nor does it deteriorate over extened periods. The software utilizes filters which eliminate spurious signals. The operational state is shown on your personal computer The received signal, FFT spectrum and the measurement trend are continually displayed. This displayed data can be recorded and reviewed in real or accelerated time. Use of the recording and reviewing capabilities allows the system parameters to be optimized offline. The controller outputs the internal temperature and any abnormal conditions (i.e. a lowering of received signal power, rising temperature in the controller and communication failures), which can be shown on the display (optional). Convenient built-in functions A reference point and the required range are easily preset. Compatible for use with a personal computer. Wide range of power supply 90 240V, 50/60Hz. Communicates with a Personal Computer by RS-232C. 4-20mA, analogue output. RS-422 digital output terminals (distance, receiving power level, temperature and alarm). Lightweight and compact Can be carried by hand, lightest and smallest antenna yet. Small, easy installation, guide pipe size of 80A. High Versatility Both hardware and software can be modified to suit your requirements.